"ALL BLUEWATER BOATS ARE NOW BUILT WITH SELF DRAINING DECKS AND FULLY WELDED WATER TIGHT COMPARTMENTS WHICH MEANS IN THE UNLIKELY EVENT OF THE BOAT BEING SWAMPED, OR HOLED, THERE IS ALWAYS SOME RESERVE BUOYANCY TO KEEP THE BOAT AFLOAT"
Bluewater uses the latest in design and cutting technologies to minimize material cost and production time while increasing strength and safety. 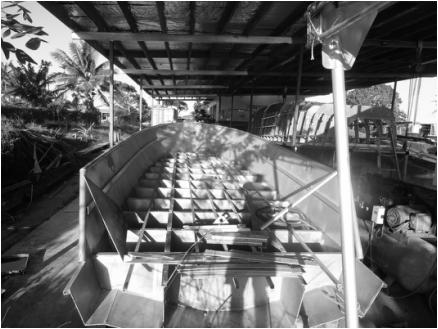 Because of the techniques that we use, Bluewater boats are without a doubt the strongest and safest boats made in Fiji today. Before even a single part of a boat is cut, designs are first modeled digitally using the Maxsurf software and then fed into Autocad, and from there the detail design of the structure can start. cutting process. The CNC cutting process allows for a cleaner, a more precision guided cut which results in being able to maximize the use of space per sheet of metal, and thus produce less wastage. These savings are then passed on to the client. Nesting also allows the pieces to fit together perfectly and requires less welding. This technique also allows Bluewater to construct boats with fully sealed sub floor compartments. A safety feature unique in Fiji to Bluewater. The bottom sections of the hull are then welded together around a sturdy framework of longitudinal girders and transverse frames.